This is the process through which interested adults and older children--either not baptized or baptized in a non-Catholic christian church--are gradually introduced to the Roman Catholic faith and way of life. 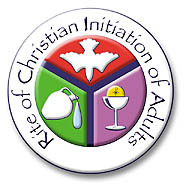 Children who were not baptized as infants are also initiated through an adapted process of this rite, sometimes unofficially referred to as the Rite of Christian Initiation of Children (RCIC). Unconfirmed adult Catholics also go through this process to prepare for confirmation. This is a period of reflection, prayer, instruction, discernment, and formation. Those who join the process are encouraged to go at their own pace and take as much time as they need. On average the process takes twelve months. Those who enter the process are expected to begin attending Holy Mass on a Sundays, attend a weekly RCIA session, and to become increasingly more involved in the activities of their local parish. An overview of the process can be found here from which the above description is based. The next Inquiry classes for adults are scheduled on an as needed basis (i.e. when we have people who are interested in attending class). Call the office for more information. You can click the below link to download the registration form. Those who begin these classes would be able to continue on to the Catechuminate once completed. You can join these classes at any time through the summer. However, if you start too late then you may not be able to come into the Church during Easter. Currently confirmation classes for adults follow the same schedule as the classes for RCIA students (see above). Our experience has been that the majority of adults seeking confirmation are not well catechized and require as much instruction as non-Catholics coming into the Church. Once you start classes, if we find you are well informed on Catholic teaching then arrangements can be made to move you into another class. Children from 2nd grade through 17 years of age who need their first communion or baptism or who are not Catholic and wish to enter the Catholic Church will start classes during the fall. OPEN ENROLLMENT ANNUALLY DURING THE MONTH OF AUGUST. Parents of those children preparing for the sacraments are required to attend a class which is at the same time and day of the children's classes. Contact the parish office for registration. In addition to attending all classes (including parents attending the parent classes), it is expected that families attend Sunday mass or the Saturday vigil mass every week. Pray: Begin praying in your own way and words. God is not aloof and distant: He is close at hand and waiting for you to invite Him into your heart and your life. However, He respects your freedom to say "no"; so, start saying "yes" with prayer. Begin attending mass: as a non Catholic you cannot receive Holy Communion during the mass; however, all are welcome to come to the mass and begin receiving the richness of this 2000 year old tradition. Read about the Church and the Lives of the Saints: Their are many good books and web sites with information on the Church and the various saints throughout history. However, there are very many bad websites and books as well! By "bad" is simply meant they are misleading or provide false information about the Catholic Church: so be careful what you read. Click Here for some suggestions on sites and books you can trust. Pickup a copy of the Catechsim of the Catholic Church (CCC) or the YouCat (a simplified version of the CCC). You can view it on line here. The bible is the Word of God in that the human authors were writing under the inspiration of the Holy Spirit. The only authoritative interpretor of the bible is the Church established by Christ, i.e. the Catholic Church. However, God wills that you read the bible and begin to learn about the history of his love for you! For some information on reading the bible click here. For a fuller in depth introduction on reading the bible click here. A short history of the bible? FAQ on the Bible and the Catholic Mass? Who is RCIC for? Older children (8-15 yrs) who have never been baptized or who have been baptized in another Christian faith. However, children who have not received First Communion at the proper time and who do not know the faith are usually included in these classes. What sacraments will children receive? If the child is 12 or older then they will receive all the Sacraments of Initiation: Baptism, Confirmation and First Holy Eucharist, or, if already baptized in a non-Catholic community and after making a Profession of Faith, Confirmation and First Holy Eucharist. Children will also receive 1st Reconciliation (Confession). If younger than 12 they may be asked to wait on confirmation depending on their maturity level. How long is the RCIC process at Holy Family, Seattle? One school year from September to May. However, this may be changing soon to a two year program. When do classes meet? Classes meet Mondays from 6:30pm to 8pm, and begin in September. When can my child start and how much does it cost? Classes form every fall: Registration fee is $80. If you are laid off or have trouble paying this amount speak to the coordinator. No one is turned away due to inability to pay. How do I enroll my child? During the first two or three classes, registration can be done before class. After the third class has completed then parents may register new students by appointment only. Contact the parish office to receive an RCIC Inquiry Form and to make an appointment. What is required of a parent in RCIC? Regular attendance at Sunday (Sat. vigil) Mass and any retreats and rites which apply to them, as well as active participation in conferences and catechetical classes during the year which are given at the same time as the children's classes. Additionally, godparents must take baptismal classes, either at Holy Family or their own parish. A written confirmation of completion is needed from the class instructor. Can more than one child from the same family be enrolled in RCIC? Yes! In many cases when a family is joining the church together, there is more than one child involved! It’s highly encouraged for all children to be enrolled at the same time. Children under the age of reason (i.e. up to 6 years old) do not have to take classes to be baptized; however, they will need to attend first communion classes when they reach 7 years old.